Even after following rigorous quality checks and maintaining standard processes, having a few dissatisfied customers is inevitable for any brand. Usually, the unhappy customers are always much more active than the happy customers. So quickly responding to customer complains is the best way to control the damages and cope with the setbacks for any brand. 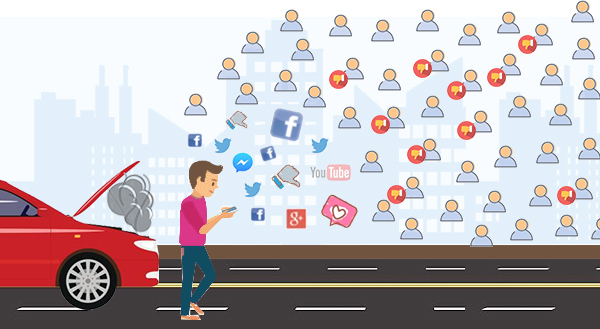 In today’s social media era, when everybody is connected with lots of people through social media platforms, even one unhappy customer can cause a lot of damage to a brand’s image. Each bad review about a brand negatively hampers its perception in the market. This is why, manufacturers should put in a lot of efforts towards brand protection, social reputation management, and damage control. To convert a one-time customer into a repeat one, your customer needs to have a good experience with the first purchase of your product and the support experience post-purchase. Repeat customers bring profit to your company as they do good publicity of your products through word of mouth and many of their friends also become your customer. If people unknowingly happen to buy counterfeits of your products, they tend to lose faith in the brand. Because the product may stop working in a few days, or it may be of poor quality or may pose health hazards. And they associate this terrible experience with your brand, so they will want to avoid your brand the next time they make a purchase. Many times counterfeits work fine, and buyers don’t even realize that they own a fake product. Even then manufacturers are at a loss, as someone else is exploiting their brand and revenue. So the brands need to assure their customers that they have bought a genuine product. NeuroTags offers a cost-effective and easy to employ digital solution for brand protection. NeuroTags provides AI-backed, mathematically linked tags for the manufacturers. Because of robust technology in the back-end, these tags help eliminate the counterfeits completely. Manufacturers need to apply these tags to the products in order to stop the counterfeits. When any customer has a bad experience, they first try to find the solution with the manufacturer. If the issues are not addressed the right way, they turn to social media platforms to make their voices heard. If a manufacturer uses smart tag by NeuroTags on the product. The customers can scan the tag in case of issues with the product. And they right away have access to a platform to submit their grievances. With the help of NeuroTags, their feedback directly reaches the manufacturers in real-time. Now, the manufacturers are sure that their genuine customers only are reporting the problems. Therefore they can take corrective actions without wasting any time and protect their brand’s image. Taking swift actions against lousy customer experiences is the best thing a company can do to control the damages and bounce back from the setbacks. The more delayed the corrective actions are, the more difficult it is for a company to regain its reputation. Manufacturers need prompt access to the customer’s data, and information of the product bought, to address his/her problems. NeuroTags helps manufacturers collect this information directly, without depending upon other layers in the supply chain to get this data. If lots of customers have similar complaints from one city, then it is possible that a faulty product was rolled out in the market. So it is best to recall the product as soon as possible in such a case from other cities where the sale has not begun. With the help of NeuroTags, manufacturers have information of all the unsold inventory and distributors of the products that are floating in the market. They can start recalling those products from the market for correction much before it reaches the customer. In summary, once manufacturers start using NeuroTags, there are endless ways they can start utilizing the data and technology to protect and enhance the brand.